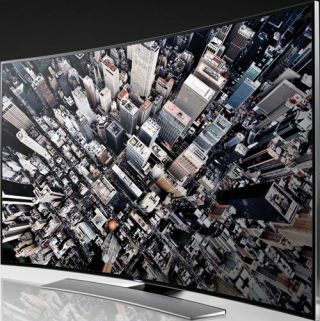 Samsung's new range of curved UHD TVs now on sale | What Hi-Fi? Samsung's new 55in and 65in HU8500 curved UHD TVs are now on sale at selected retailers across the UK, with prices starting from £2699. The Korean manufacturer's range was first shown off at CES 2014 and later given an official launch at The Gherkin in London last week. Samsung claims its new Ultra HD sets offer "a deeper sense of depth, wider viewing angles and cleaner picture quality with higher contrast levels". The company has also adopted a technology called Auto Depth Enhancer. This aims to analyse different areas of an image on the screen and adjust contrast levels to provide a "superior sense of depth". The TVs feature a 4.2m radius curvature, which Samsung says is optimised for the average viewing distance and offers a wider field of view by shortening the distance between the viewer and the edges of the screen. Meanwhile, the sets also feature "four-step UHD upscaling technology" that converts standard- and high-definition images to those of a higher and sharper quality. The Samsung UE55HU8500 is on sale for around £2699 and the 65in UE65HU8500 is on sale for £3999.